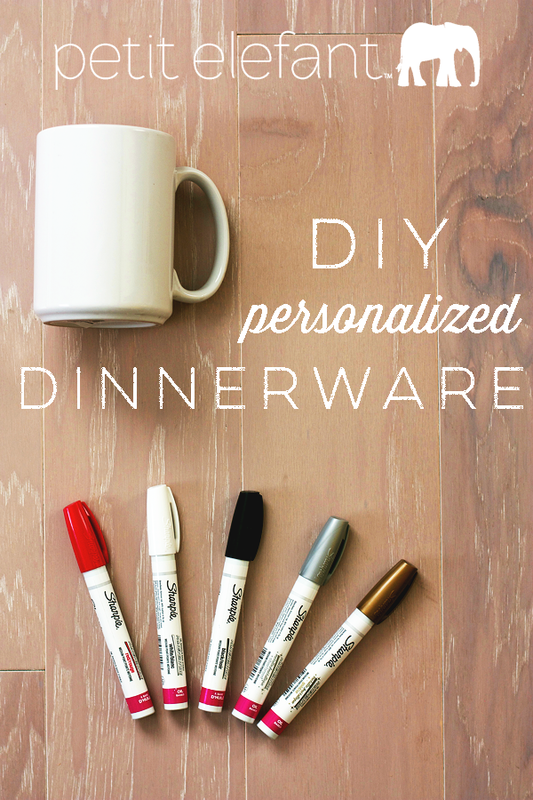 Today’s how to: Make Personalized Dinnerware! 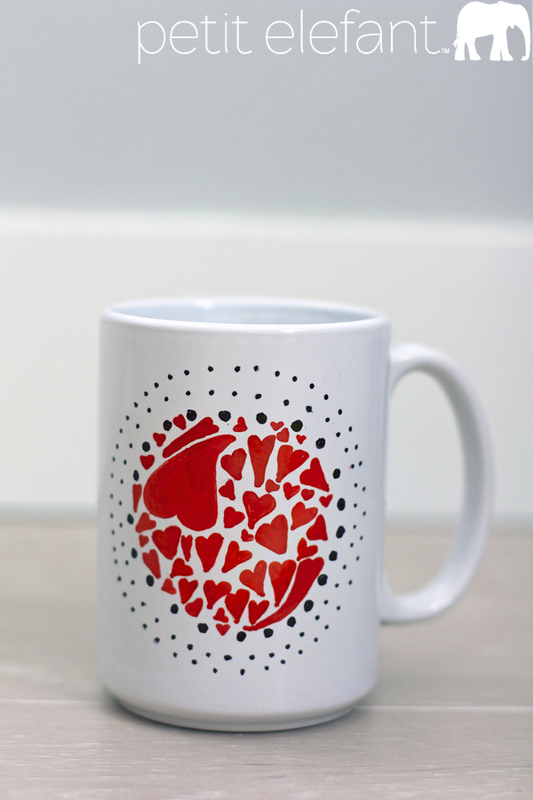 You guys, I’ve been wanting to make my own how to, markered-up plates and mugs since Pinterest became a thing. 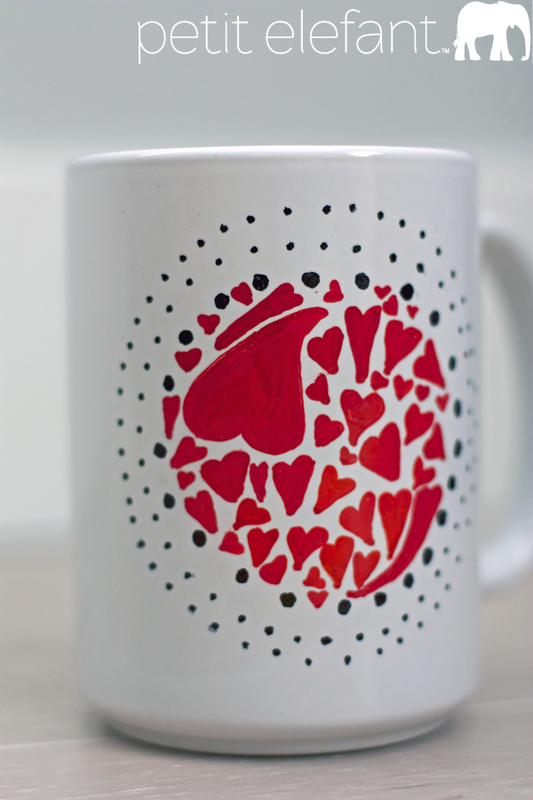 Truly, I’ve had this Sharpie Mug DIY from A Beautiful Mess bookmarked since 2012. Finally, on a whim one night I ordered these Sharpie Oil Based Markers from Amazon and I’ve been playing around with them since. It’s so much fun, I can’t even tell you. Step 1: Once you’ve selected your dinnerware (I started with one plain white mug) sit down somewhere comfortable with your markers. Turn on your favorite tunes, a great TV show you’re in the middle of binge watching on Netflix (who YOU? ), or listen to an audiobook. This is sort of a zen process and like any good art project, it can’t be rushed. Step 2: Shake your markers! Shake ’em like a Polaroid picture. Okay, maybe not quite, but you want to mix up the pigment inside the markers and get it all ready for business. Use the back side of a bill, or some other unpleasant scrap paper around your house, (like maybe a breakup note from a significant other – something you’d like trashed ASAP) and test out the markers. You might have to gently push down a few times on the tip of the marker to get the fluid rolling. 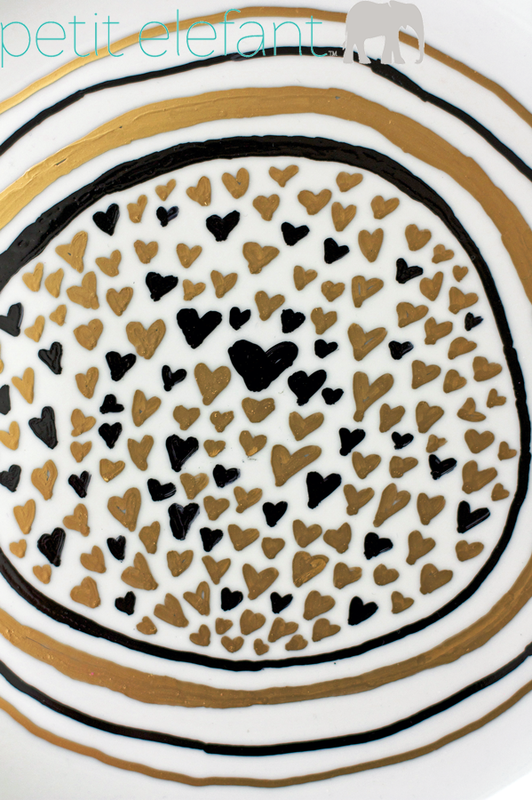 Step 3: Carefully sketch or draw your design on your dinnerware. I started from the center and worked my way out so I didn’t smudge anything I’d already drawn. Also, any mistakes I made I was able to erase with a dry cloth. If that didn’t fix it I used a slightly damp paper towel to erase. Step 4: Finish your design. 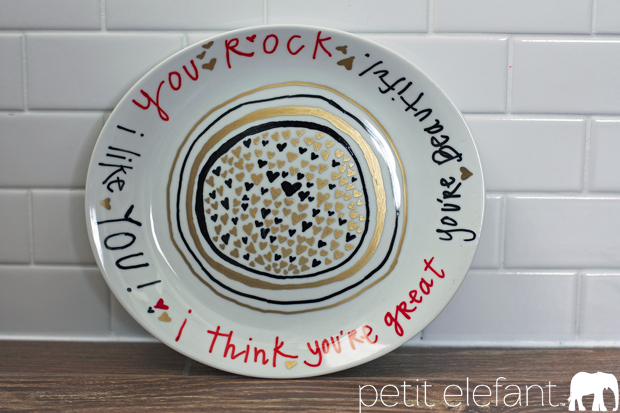 Make sure your plate or mug or bowl, (dinnerware we fancy folks call it, *cough*) is designed to your satisfaction. Now’s the time for all your little last minute touch-ups. Step 5: Put your dishes straight on the rack and turn the oven on to bake at 350 degrees. Allow the dishes to heat up right along with the oven. Bake for 30 minutes. Set a timer and go lie down for a nap, I have a sneaky feeling you need one. Step 6: After 30 minutes turn the oven off completely. Leave the dinnerware in the oven while it cools. Pinkie promise it’s okay. Step 7: Once the dishes are completely cooled, like 24 hours later cooled, wash gently wish a sponge and dish soap. 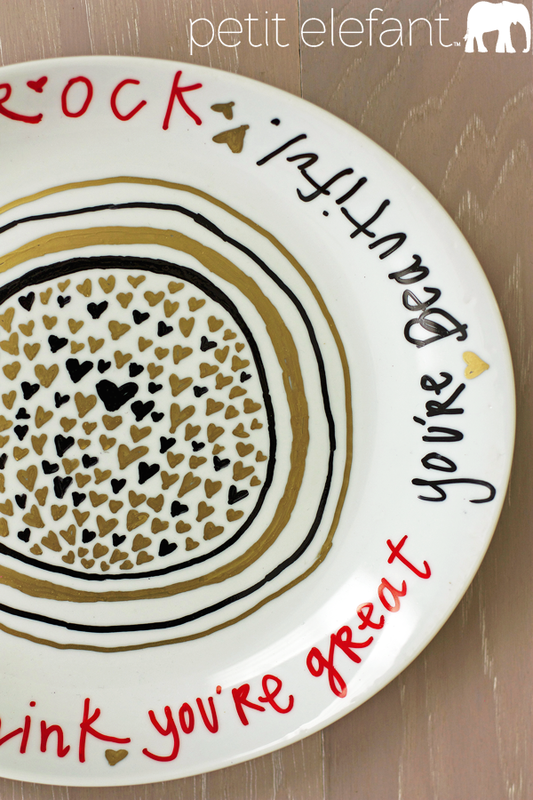 Step 8: Enjoy your gorgeous, personalized dinnerware! Note: P.S. We washed one of the mugs in the dishwasher a few times and it was no bueno. The design started to wash off a bit. People all across the internet have had mixed success with using a dishwasher, but it wasn’t our best bet. I have read that dinnerware using the Pebeo Porcelain Markers is able to go through the dishwasher with no ill effect, but this one’s really up to you. I don’t mind hand washing a few dishes now and again.